I attended my first VMUG meeting in 2009 and they were talking about ESX vs ESXi and I ended up playing with ESXi 3.5 on a spare machine and learning that. I had a coworker that had left where I was at and joined a new company. He knew I was starting to play with VMware so he gave me some insight on how it was running at his new job. I was fascinated as he told me about vMotion and how you can have a running VM highly available and can migrate from host to host. He told me how DPM could power up and power down hosts throughout the day as load increased and decreased in the cluster. I decided to dig deeper at this point and buy a real server and continue my education. I learned by attending a VMUG Virtual event of Install Configure Manage courses that were available at a local tech college for a fraction of the normal cost. I enrolled in the course and took my first VCP exam in 2014. It was at this point I started working with VMware at the professional level for the first time. Managing clusters for 5 locations across the Midwest. 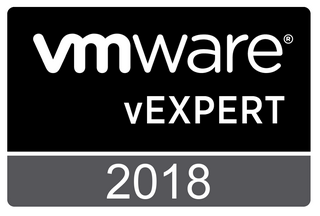 I learned so much in this role and had a manager that was very open to supporting all of my efforts to learn more about VMware and get involved in the community. We deployed our first vSAN cluster in 2016, I dove right in and learned this fascinating new tech. I immediately saw the value of vSAN and thought about how they were doing the same thing for storage with vSAN as they had done for virtualization with vSphere. I started with the help of many mentors and encouragement from my local Wisconsin VMUG leadership to do public speaking based on my experience deploying and managing my vSAN cluster. Speaking kept leading to more opportunities to speak and get more involved in the community.